Successfully Added ID Card Camera and Hidden DVR (HD, Motion Detection) to your Shopping Cart. For undetectable and inconspicuous covert surveillance, look to the ID Card Camera and Hidden DVR (HD, Motion Detection). The small pinhole camera inside secretly records high quality video, takes instant picture snapshots without anyone ever knowing. With an ultra-thin 5.3mm thickness and ID card design, this ID Card Camera makes for the perfect portable covert surveillance device. Just hang it around your neck like a normal ID card (or clip it onto your clothes) for access to one-button video recording, and picture snapshots. This device is ideal for citizen journalists doing undercover video recording, activists trying to capture evil companies dumping toxic waste, or anyone wanting to look like a company employee while secretly working to take down "the man". So what else makes this camera so appealing? Is it the high resolution video, so you can capture everything in high quality? Or maybe its the high sensitivity mic for voice recording, which will record every secret spoken. Or even the instant 1600 x 1200 (HD) picture snapshots? Whatever it is, this ID Card Camera has something for everyone! 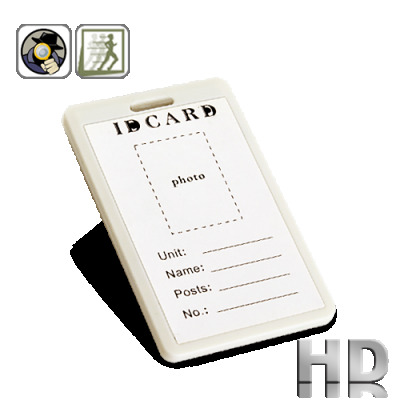 Additionally, this ID Card Camera comes with motion-detection activated recording. Just leave the device ON and it will automatically record only when movement is detected. This is the best way to catch people snooping around your office, your personal maid stealing your jewelry or maybe your partner cheating on you. What is more, this ID Card Camera comes with a huge 4GB of internal memory that is enough for over 15 hours of video recording, 50 hours of audio-only recording, or over 6,000 picture snapshots. Also includes plug-and-play functionality so you can easily access your recorded files on your computer. You have an ID card camera, cross camera, flashlight camera, pen camera... when can I expect a ____ camera? If there's a specific design you want and plan on making bulk orders (200+ units), please contact our CS team.